It seems that with the ongoing digital transformation paper has become somewhat obsolete. But the truth is far from it. Nowadays we use paper more than we ever did before and in the process we create extreme damages to the environment. Negative environmental impacts occur at three stages in the life cycle of paper, beginning with the harvesting of trees for fiber, continuing with the processing of wood fiber into pulp for making paper, and finishing with the disposal of paper products at the end of their useful life. As it exists today, the paper-making industry primarily depends upon virgin wood-based fibers to make the pulp that becomes sheets of paper. Much of the wood used comes from old growth and environmentally sensitive forests in all parts of the world — to give just two examples, the boreal forest in Northern Canada and tropical forests in Southeast Asia. In a number of countries like Indonesia, Papua New Guinea, and Russia, the logging that takes place is not only unsustainable but also carried out in areas where it is illegal to log. Once exported to other countries to be milled and manufactured into a variety of products, including paper, it is difficult to tell whether the wood was legally or illegally logged. The pulp and paper industry is very energy intensive, requires extremely large amounts of water, and often entails the use of toxic chemicals, of which the most problematic are the chlorine compounds used in bleaching pulp to make bright white paper. Although many companies have become more energy efficient, and even generate some of their own power from the wood wastes associated with the manufacturing process, the United States government figures show that pulp and paper manufacturers are the fourth largest industrial emitters of greenhouse gases. Further, the pulp and paper industry releases about 212 million tons of hazardous substances into the air and water — amounts comparable to the United States primary metal industry — and is ranked as the third largest user of industrial water. These figures highlight the industry's impact on our environment, despite improvements associated with requirements of the Clean Air and Clean Water Acts and with more general efficiency measures. Enter Woody Harrelson. The actor which is also famous for his environmental activities has reinvented the paper industry with his company named “Step Forward Paper”. With unique technology, Step Forward Paper turns leftovers of wheat production into high quality paper! The company describes it as the following: “Step Forward Paper is made with 80 per cent wheat straw, which means 80 per cent less virgin forest fiber than traditional papers. It is the first paper of its kind to hit shelves in North America, and a big step towards meeting more of our paper needs from leftover straw instead of ancient forests. The paper is made from leftover wheat straw and does not impact the food supply chain. Step Forward Paper™ enjoys a small environmental footprint – transportation emission costs are low, and savings are made from not harvesting the valuable carbon stored in our world’s forests”. 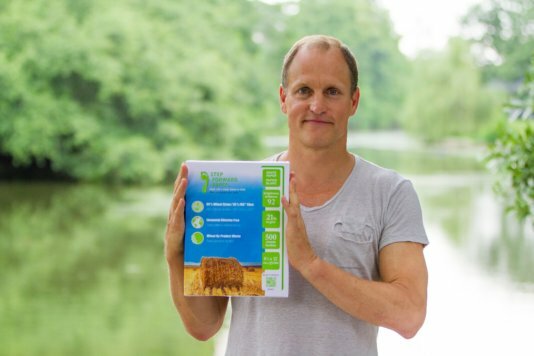 Harrelson, with his deep love for trees, explains in this video how Step Forward Paper can change the world.